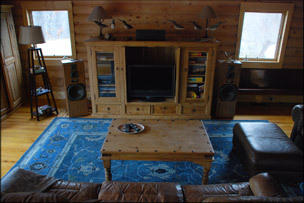 Cozy and rustic; the living room is decorated with antiques and a homage to Grandpa Carman's wood carved birds. The living room features leather seating, to enjoy music or a movie. 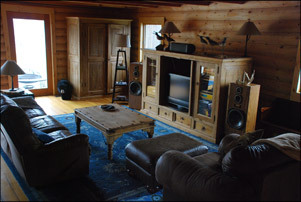 A selection of DVD's, CD's, books, games and puzzles are stored in the pine entertainment and armoire cabinets. The game table invites family fun and spill-over seating for dining. The living room French doors open onto a ten foot deck with a view of the lake between a tree lined walkway.